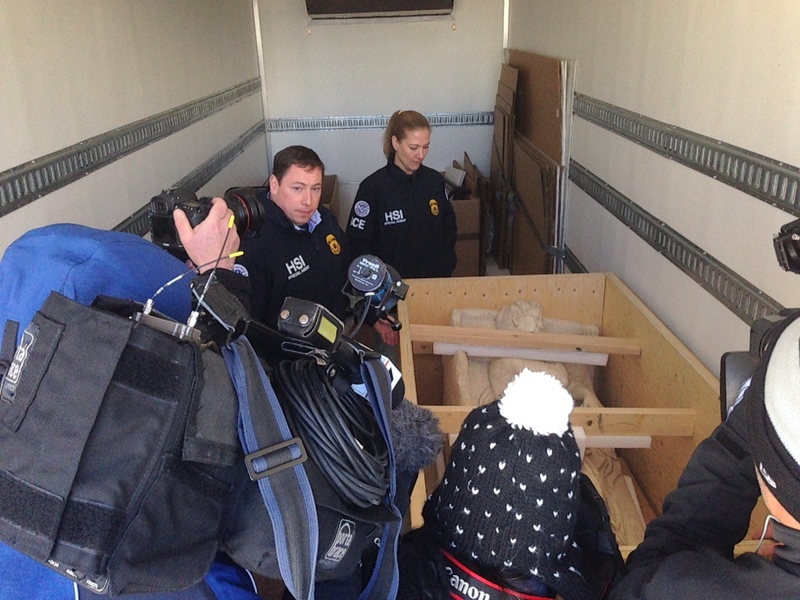 A remarkable document filed with New York’s Supreme Court on Friday reconstructs the journey of an ancient sculpture of a bull’s head from its theft during the Lebanese civil war through the shadowy corners and winding pathways of the international antiquities black market. The filing, an application for a turnover order filed by Deputy DA Mathew Bogdanos, recounts a Grand Jury investigation that traced the stolen relic through a who’s who of the antiquities trade before ending up on loan at the Metropolitan Museum of Art, where it was seized in July. The 66-page filing is worth reading in full, as it bristles with insights into the antiquities trade that Bogdanos, the author of Thieves of Bagdad, has collected over more than a decade investigating antiquities trafficking networks. It is also a testament to the type of dogged investigation required to uncover the true history of a stolen antiquity. Bogdanos’ investigation included the use of Grand Jury subpoenas, search warrants, interviews with witnesses in several countries and thousands of pages of shipping documents, customs forms and email correspondence. Anyone familiar with investigations of Mediterranean smuggling networks over the past two decades will recognize the dozen names associated with the object’s past. July 8, 1967: The bull’s head was excavated from the Temple of Eshmun in Sidon, Lebanon, by French archaeologist Maurice Dunand as part of a state-sponsored excavation. 1979: Amidst the raging Lebanese civil war, the bull’s head and other artifacts from Eshmun were transferred to Beirut and then to a storage area of the Byblos Citadel for safekeeping. 1981: Armed members of the Phalangist paramilitary group seized objects from the Citadel, including the bull’s head. After negotiations with the antiquities directorate, the Phalangists return many of the objects to the Citadel. But the bull’s head and dozens of other objects are not among them and disappear into the black market. 1980s: The Bull’s Head is associated with the George Lotfi Collection of Beirut and Paris and with Frieda Tchacos in Zurich (Nefer Gallery), according to a subsequent claim by the Met’s curator of ancient art Joan Mertens. Her source for this information is never clarified or documented. April 11, 1991: Four sculptures stolen from Eshmun appear in an auction by the Numismatic & Ancient Art Gallery in Zurich. They are seized and returned to Lebanon. December, 1994: Sotheby’s offers a male torso and a sarcophagus fragment from Eshmun for sale. Both are eventually seized and returned to Lebanon. Several more Eshmun objects are recovered over the years. May 18, 1996: The Bull’s Head re-appears in shipping documents and was delivered to London antiquities dealer Robin Symes’ New York penthouse at the Four Seasons’ Hotel on 57th Street. November 27, 1996: Symes sells the Bull’s Head for $1.2 million to Lynda and William Beierwaltes of Colorado, who display it in their dining room. While Symes assures them the object is authentic, as Bogdanos notes, “there was not a whisper-not even the faintest hint of a whisper about whether it was a lawful antiquity. Indeed, the lawfulness of the Bull’s Head (C-17) does not appear to have been part of any documented conversation between the Beierwaltes and Symes.” The Bull’s Head appears on the market “like Athena full-grown from the brow of Zeus,” Bogdanos writes, one of several flourishes in his filing. 1998: The Bull’s Head and other objects in the Beierwaltes collection are displayed in an article in House and Garden. Christos Tsirogiannis, a forensic archaeologist specializing in identifying illicit antiquities, identified many looted antiquities in the Beierwaltes collection by matching the photographs in the article to photographs of looted antiquities contained in dealer archives. 2004: The Beierwaltes ask Max Bernheimer, Head of Christi.e’s Ancient Art & Antiquities Department, to appraise their antiquities collection. He appraised 115 objects in the collection at $51.5 million but never offered it at auction. Symes was revealed as their main supplier, the source of 97 of the 99 objects that listed a prior owner. “Symes was not just their main supplier, he was to all intents and purposes their only supplier: the direct, the essential, and clearly much-used link in a supply chain that started with the tombaroli and ended with the Beierwaltes,” Bogdanos writes. 2005: The Beierwaltes approach Hicham Aboutaam at Phoenix Ancient Art about selling the Bull’s Head and other antiquities in their collection, which is estimated to be worth $95 million. Phoenix appraises the value of the Bull’s Head at $1.5 million. 2008: Phoenix Ancient Arts publishes images of the Bull’s Head in their Geneva catalog in advance of showing the Bull’s Head at the 24th Biennale des Antiquaires at the Grand Palais in Paris. After the Paris show, it is shipped back to Geneva. September 2009: The Bull’s Head is shipped to New York, where hedge fund billionaire Michael Steinhardt expressed an interest after seeing it in the Phoenix catalog but claimed in an email he was too “broke” to buy it at the time. August 10, 201O: Steinhardt acquired the Bull’s Head for $700,000 and left it on display at Phoenix Ancient Art’s New York Gallery. October 2010: The Bull’s Head is loaned to by Met by Steinhardt through Phoenix Ancient Art Gallery. The only reference to its provenance is a single line of six words: “Ex-American private collection, collected in 1980’s-1990’s.” When the Met presses for more detail, Phoenix says The Beierwaltes aquired it from Symes. April 2014: Carlos Picon, the Curator in Charge of the Met’s Greek and Roman Department, noticed that the Bull’s Head on loan from Steinhardt appeared to be the same bull’s head missing from the Eshmun excavations. The object was removed from display and Aboutaam was notified. April 16, 2014: Given the revelation, the Beierwaltes re-acquired the Bull’s Head from Steinhardt for $560,000 ($700k minus Aboutaam’s 20% commission). Steinhardt receives a piece of equal value from Aboutaam. October 2016: Met General Counsel Sharon Cott writes to Steinhardt saying the Met intended to notify Lebanese authorities about the stolen Bull’s Head. William Pearlstein, the Beierwaltes’ attorney, acknowledged that the bull’s head was likely the one found in Eshmun but asked the Met not to contact authorities. Dec. 5 2016: Met director Thomas Campbell notifies Lebanon that the bull’s head on loan to the museum appears to come from Sidon. January 10, 2017: Sarkis Khoury, the Lebanese Director General of Antiquities, requests the return of the stolen Bull’s Head. He also writes to the Beierwaltes with a similar demand in March. June 2017: Amid the District Attorney’s investigation, counsel for the Beierwaltes filed a pre-emptive lawsuit against the Lebanese Republic and the Manhattan DA’s office seeking to prevent the seizure of the bull’s head. July 7, 2017: Acting on the request from Lebanese authorities, the DA’s office seized the Bull’s Head from the Met. UPDATE September 2014: Japanese dealer Noriyoshi Horiuchi has agreed to return the sarcophagus lid to Italy in a stipulation reached with the federal government. Rick St. Hilaire has the news here. Federal authorities seized a $4 million Roman sarcophagus lid from a New York warehouse on Friday, alleging it had been looted, smuggled out of Italy and sold to convicted Italian antiquities trafficker Gianfranco Becchina in the 1980s before passing through a who’s who of the illicit antiquities trade. The sculpture surfaced again in May 2013, when it was exhibited at the Park Avenue Armory by Phoenix Ancient Art, the antiquities dealership of Hicham and Ali Aboutaam, Lebanese brothers who have both been convicted of crimes related to trafficking in looted art. The Aboutaam’s lawyer told the New York Times that they had exhibited the sculpture on behalf of a client and played no role in its shipping or importation. The Aboutaams would not identify their client. Records show that the sculpture was in the possession of Noriyoshi Horiuchi, a Japanese antiquities dealer with close ties to Becchina. Horiuchi was instrumental in building the antiquities collection at the Miho Museum and returned more than 300 looted antiquities to Italy after a 2008 raid on his Geneva warehouse. UPDATE: Phoenix has confirmed to another journalist that their “client” was Horiuchi, who had been asking $3 million for the sarcophagus. The gallery claims to have conducted “comprehensive due diligence” on the sarcophagus tracing it back 30 years but did not learn that it had belonged to Ortiz and Becchina. The seizure of the Sleeping Beauty was possible with the help of Italian investigators and their access to the Becchina Dossier — the dealer’s archive of business records and photographs documenting his several decades in the illicit antiquities trade. The Becchina archive’s 140 binders contain more than 13,000 documents — shipping records, invoices and thousands of Polaroid images showing recently looted artifacts, including the Sleeping Beauty. It was seized in 2002 by Italian and Swiss authorities during a raid on Becchina’s Basel warehouse and gallery Palladion Antique Kunst. 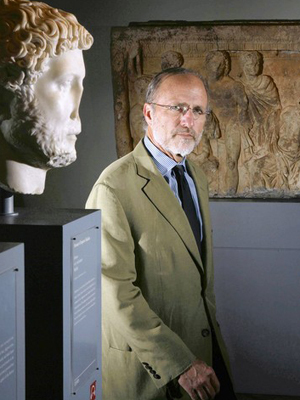 In 2011, Italy convicted Becchina of being a key middleman in the illicit antiquities trade. He has appealed that conviction, but the seizure of his archives was upheld by Italy’s high court in February 2012. Becchina’s archive is far more detailed that that of his more famous rival, Giacamo Medici, whose collection of Polaroid photographs sparked an international scandal and forced the return of more than 100 prized antiquities on display at American museums. As the case of the Sleeping Beauty illustrates, the Becchina Dossier provides an unprecedented roadmap of the illicit trade of Greek and Roman material looted from Italy and beyond. Records from Becchina’s archive show the looted sarcophagus was first offered to Becchina by Antonio “Nino” Savoca, an Italian dealer with a shop in Munich who acquired it from looters along with a cache of other large marbles. Savoca sent Becchina a series of Polaroids showing the sarcophagus lid in two fragments. In the image below, you can see the bottom half of the sculpture showing the Beauty’s knees and feet. A receipt dated 8/8/81 shows Becchina bought it for 7.5 million lire from Carlo Ciochetti, a frontman for Savoca in Rome. A Swiss customs form dated 8.14.81 shows Becchina imported the sarcophagus to Basel, where it was accepted by his shipping agent Rodolphe Haller. A receipt dated 9/15/81 shows Becchina sold the fanciulla,or maiden, to Swiss antiquities collector/dealer George Ortiz for Fr. 80,000. Sources say that in fact Ortiz provided the financing for Becchina’s purchase of the sarcophagus and the two owned it jointly for several years. An image attached to the Ortiz receipt shows the sarcophagus as it appeared before restoration. In 1982, the sarcophagus was offered for sale to the Getty Museum, which turned it down, sources say. It was also exhibited at a the Historical Museum of Bern for several months during late 1982 and early 1983 and published in a German catalog. 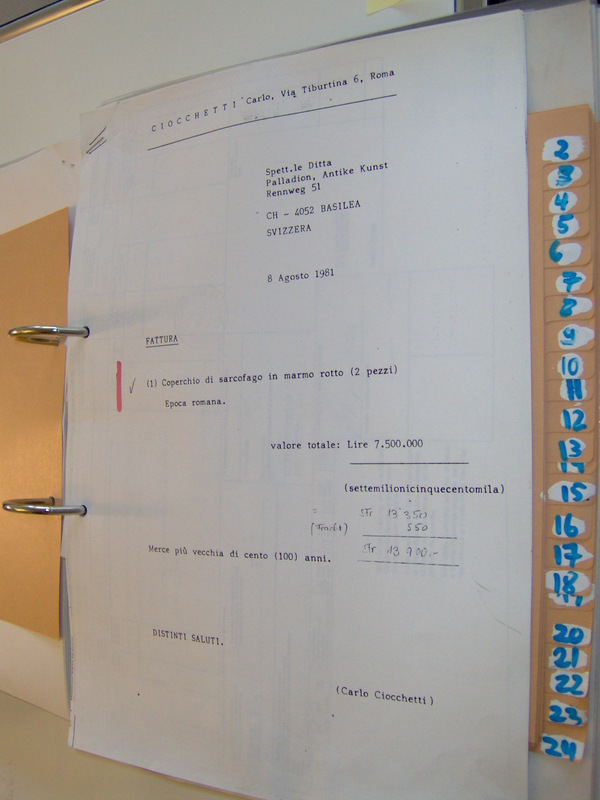 A list written in German and dated July 15 1986 describes “a broken sarcophagus ex Ciochetti” as the first of 24 objects jointly owned by Becchina and Ortiz. Many of the objects on the list are the same as those recently looted objects shown in the Savoca Polaroids. It is not clear what happened to the sarcophagus after 1986. At some point it was extensively restored, with the missing marble fragment at the break-point filled in, and acquired by Horiuchi, the Japanese dealer known to have worked closely with Becchina. When and how it was imported into the Unites States is still under investigation. This is the condition it was found in when federal agents discovered it in the warehouse in Long Island City, New York. And here are images of the Sleeping Beauty’s seizure today, courtesy of ICE and Tony Aiello, a reporter at CBS New York. Over the last five years, the J. Paul Getty Museum has earned a reputation as a leading reformer on a topic that has embroiled American museums in scandal for the past decade: the acquisition of recently looted antiquities. After evidence of the museum’s longtime participation in the illicit trade was uncovered by Italian and Greek investigators, the Getty agreed to return 49 of its most prized pieces of ancient art, cultivated collaborative relationships with those countries and adopted a strict acquisition policy, setting a standard that has been adopted by museums across the country. But come September, when Timothy Potts starts as director of the Getty Museum with Getty Trust CEO James Cuno as his boss, the institution will be led by two men who opposed the adoption of some of those reforms. Cuno has denounced repatriation claims of looted antiquities as “nationalistic” and argued against placing limits on museum purchases of objects with an uncertain origin. Potts, whose appointment Cuno announced this week, has echoed some of those views. He played a central role in establishing lenient acquisition standards for American museums — which were eventually abandoned — as a member of the Assn. of Art Museum Directors, which sets ethical guidelines for art museums. A highly respected museum director and Oxford-trained archaeologist, Potts was well positioned to wrestle with the looting issue. From 1983 to 1989, he was co-director of the University of Sydney’s excavations in Pella, Jordan. Later at Oxford, he conducted research in Iraq, and was among the most outspoken museum directors to decry the looting there in 2003. Participants in the museum directors’ group deliberating new ethical standards in 2004 recall Potts as intelligent, persuasive and open to hearing others’ arguments. But the positions he advocated often put him at odds with advocates of reform and with fellow archaeologists, who criticized the willingness of museums to purchase objects whose murky ownership histories suggested they were likely the result of looting. Potts also had brushes with the issue as director of the Kimbell Art Museum in Fort Worth, where he was director from 1998 to 2007. In late 2000, Potts approved the acquisition of a rare Sumerian statuette for $2.7 million. The 15-inch alabaster figure was an ancient masterpiece from the cradle of civilization, the region Potts had specialized in while studying at Oxford. It was to be an important contribution to the Kimbell’s small but highly regarded collection. But shortly after the statue arrived at the museum, court records show that Potts took the unusual step of returning it to the dealer and asking for a full refund. Publicly, Potts said that he wanted to free up money for other acquisitions. But he later testified that he had learned the dealer — Hicham Aboutaam, owner of the New York City antiquities gallery Phoenix Ancient Art — was under investigation by the IRS, and decided against buying from him. Soon, though, Potts changed his mind about doing business with Aboutaam. After receiving repayment for the Sumerian statuette in November 2001, Potts moved to acquire a $4-million Roman torso he had admired on an earlier visit to Aboutaam’s gallery on East 66th Street in Manhattan. Five days after the Kimbell board approved the purchase, the museum received a federal grand jury subpoena for museum records related to Aboutaam. The Kimbell abruptly abandoned the acquisition of the torso, sparking two breach of contract lawsuits by Aboutaam. The lawsuits were ultimately dismissed. Aboutaam was arrested in 2003 and charged by U.S. authorities with smuggling a looted antiquity from Iran and making a false customs declaration. He pleaded guilty to a misdemeanor and paid a $5,000 fine. While the Kimbell controversy was still unfolding, Potts played a prominent role in formulating a policy on how American museums should handle questions about ancient art with unclear ownership histories. 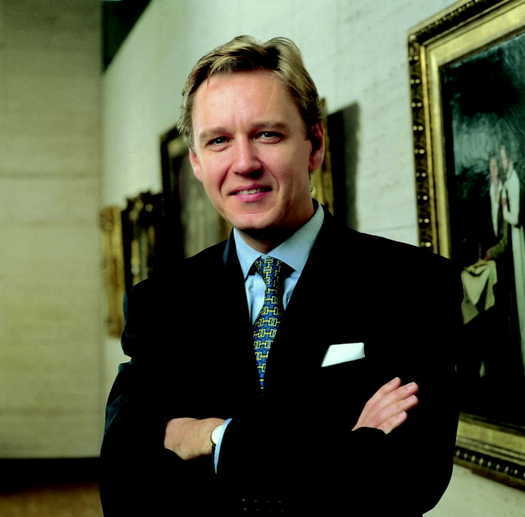 As a member of a task force of museums directors between 2002 and 2004, Potts allied himself with Philippe de Montebello, then director of the Metropolitan Museum of Art, who opposed putting limits on collectors and museums. Potts and De Montebello eventually championed a 2004 policy that allowed museums to collect ancient art as long as they could demonstrate it had been out of its country of origin for a decade. The position struck some on the task force as effectively sanctioning the acquisition of looted antiquities. And it proved out of step with the times when, a year later, Getty antiquities curator Marion True was indicted by Italy for trafficking in looted antiquities, some of which had been acquired under a Getty policy that was stricter than the one Potts and De Montebello supported. Soon, the antiquities controversy grew into a full-fledged scandal, with Italy and Greece demanding the return of some of the most prized objects in American museum collections. American museums have since returned more than 200 looted objects to Italy and Greece, valued at up to $1 billion. Potts first met Cuno while chairing a 2006 AAMD task force on loans of archaeological material. Cuno had recently taken the reins of the Art Institute of Chicago and, like De Montebello, was an outspoken critic of attempts to limit the collecting of antiquities. Cuno and Potts became like-minded allies in the heat of a growing controversy. By 2008, the policies Potts had advocated were replaced with a stricter one that required objects to have an ownership history dating back to 1970. It emulated the position of the Getty Museum, which had been hardest hit by the antiquities controversy. Potts and Cuno have signaled that their priority will be to build the Getty’s collection in new directions and shift attention back to the Getty Villa, where the museum’s antiquities collection is displayed. That could put the Getty back in business with Hicham Aboutaam, who, despite his past legal worries, continues to be a leading dealer of antiquities. In an interview this week, Aboutaam praised the selection of Potts, and said he held no grudges from the past lawsuits. “It’s rare to find a museum director with such a sophisticated eye for quality,” he said. He has similar words of praise for Cuno, who as director of the Art Institute acquired antiquities from Aboutaam as recently as 2009. That same year, Aboutaam voluntarily returned 251 antiquities to Italy, valued at $2.7 million, conceding they were likely the product of illicit excavations.